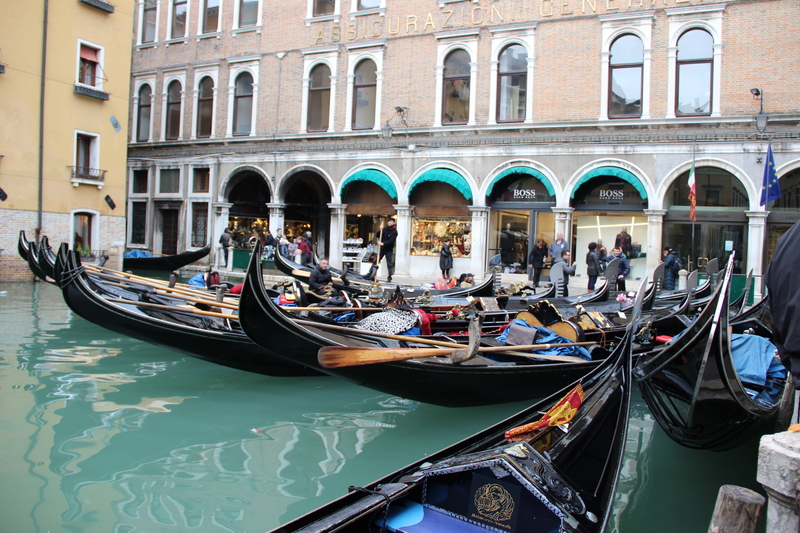 I haven’t been sleeping much in Italy so far, but I don’t feel that I’m suffering jet lag. 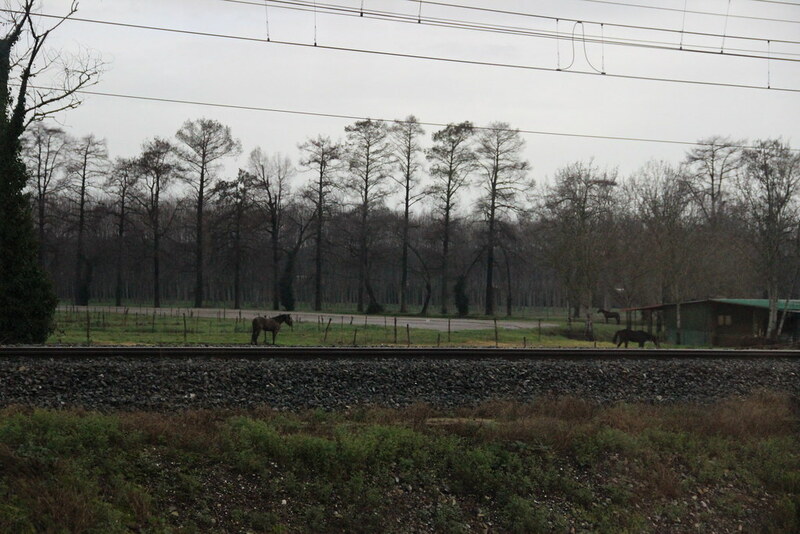 I think the fresh air and constant walking (and fewer meals) are stimulating me to be more energetic and awake. I sleep for 5 hours Friday night, waking up at midnight. I spent the rest of the early morning sitting in the kitchen with my laptop, some warm tea and gluten free cookies (I found some in the supermarket “Conad” that’s close by my apartment). I was really excited to take my first trip! I wasn’t concerned about looking like a tourist, since traveling in a group is pretty much the most obvious way of signaling tourist status, so I packed my backpack. Backpack: my planner (which goes everywhere with me), sketchbook, art pens, camera, hand wipes, trail mix, iPod (which I didn’t end up using), home-made lunch, a large bottle of water, and some gluten free cookies. 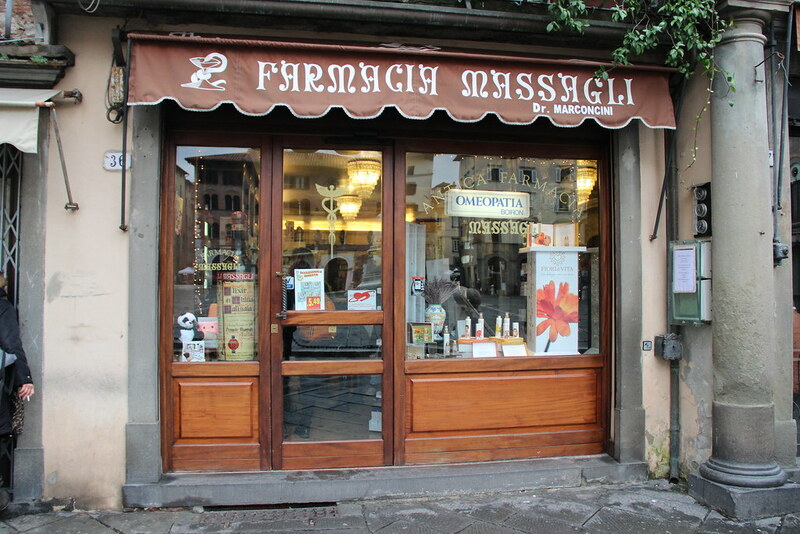 In my Baggallini purse: my gloves and wallet — I kept my eyes on my purse the entire time. 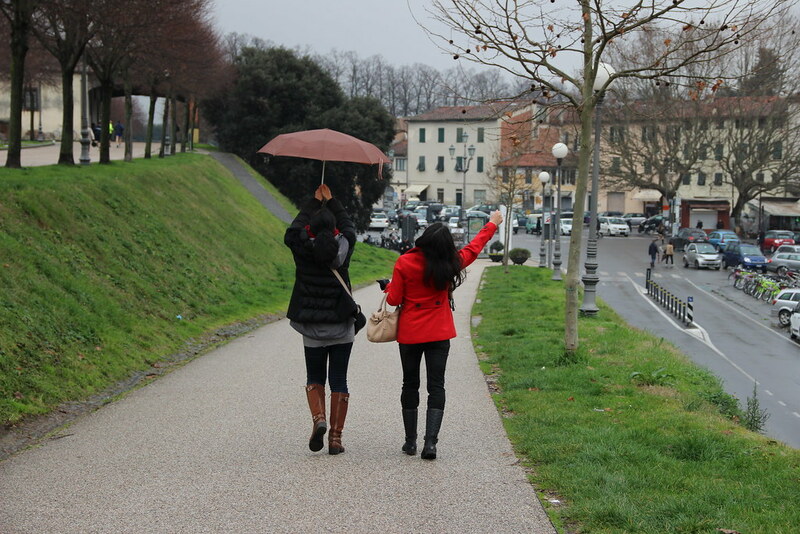 I wore a jacket I bought from the OVS department store in Florence, which is water proof. 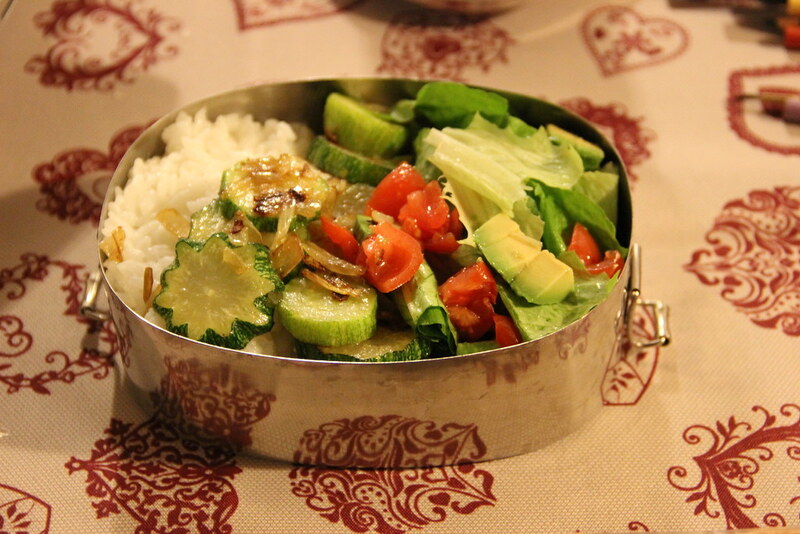 My homemade lunch: Sushi rice, salad and zucchini. I found the sushi rice sauce in the International market store Pegna. Add the sauce to regularly cooked white rice to make sushi rice. Zucchini: In my frying pan with some olive oil and salt (I brought my own, mini ceramic frying pan). Salad dressing: Freshly squeezed orange and lemon, some olive oil, red wine vinegar and salt. (I added this to some romaine leaves and tomatoes). 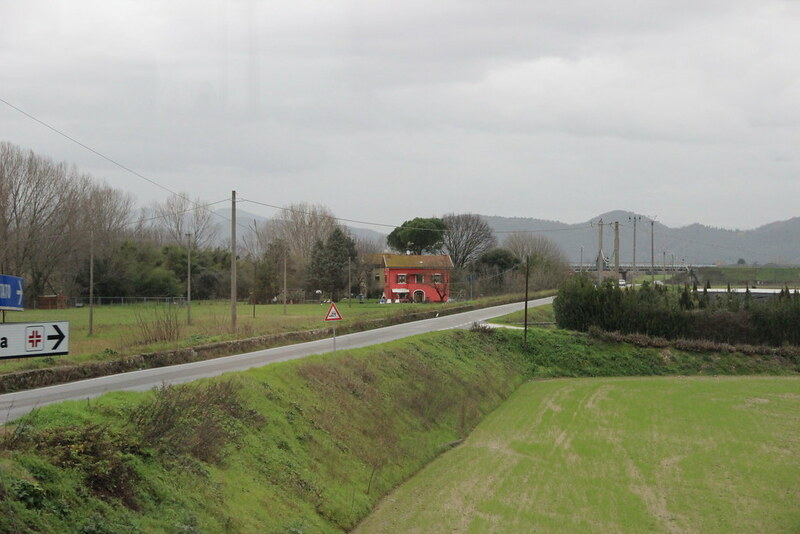 We took a bus trip (about 1 hour) to Pisa in the morning. 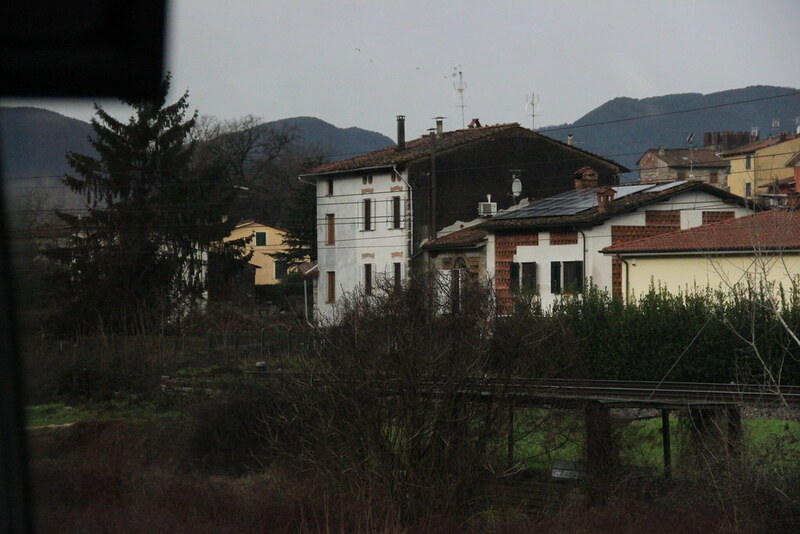 The views from the bus trip to Pisa. 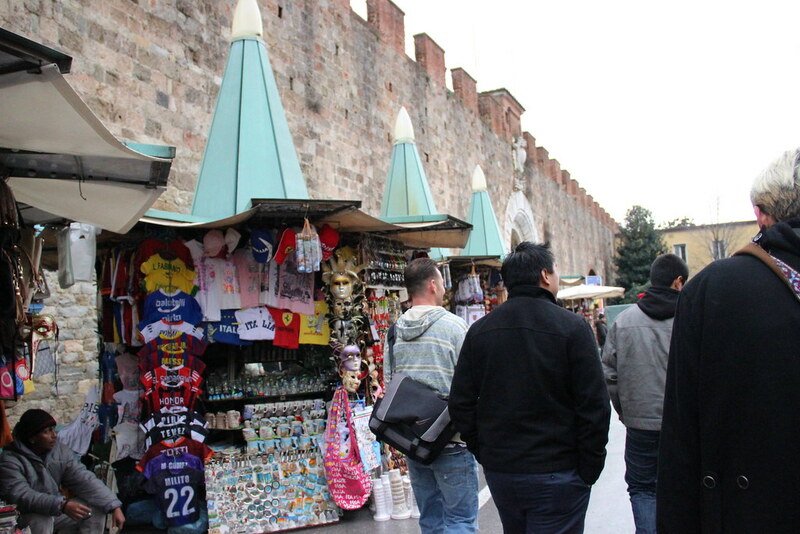 Entering Pisa, we saw all these vendors selling tourist trinkets. 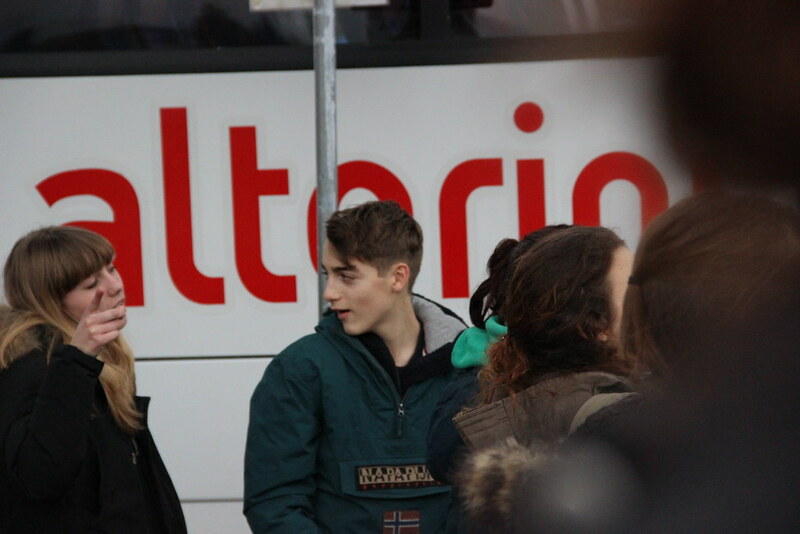 Creeper shot #2: Here we see a sulking Italian youth with the stylish hairstyle I’m currently into photographing. 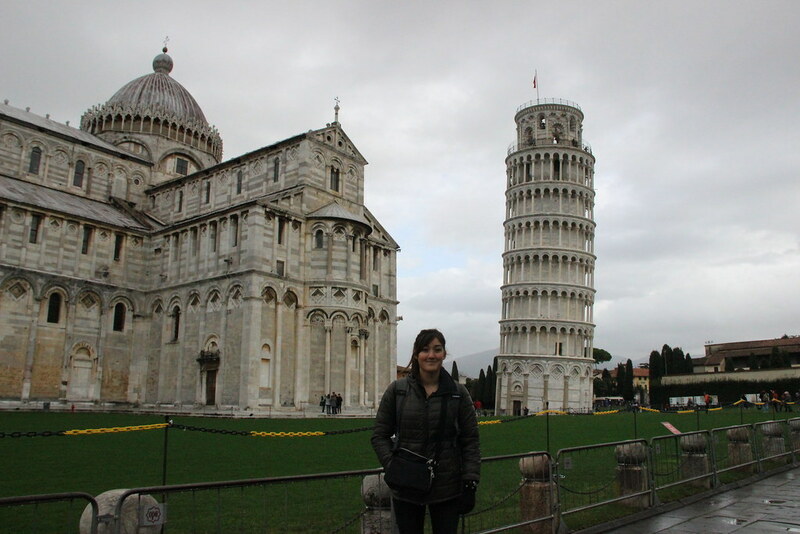 The Piazza dei Miraclo, “Square of Miracles.” (L-R): The baptistry, church and tower. 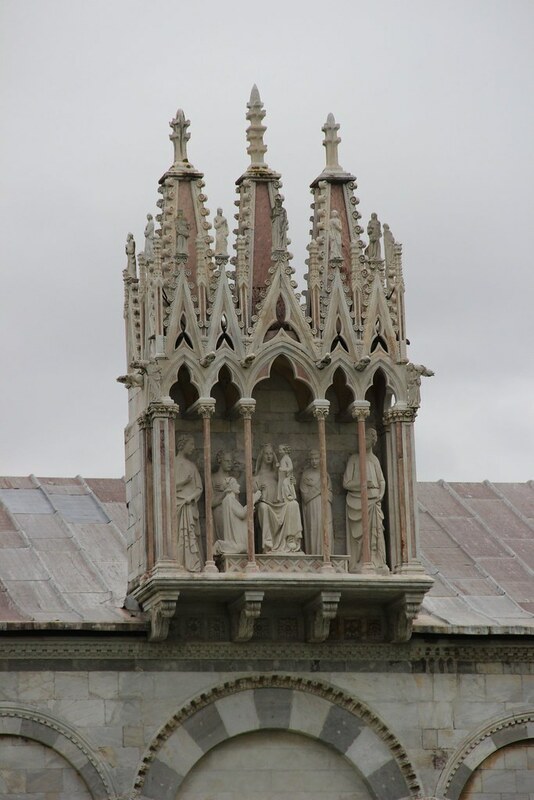 The three structures in Pisa are the Baptistry (where non-Christians were baptized, so that they could enter the church), the Church (the centerpiece and the reason the tower was built), and tower (originally the bell tower, the famous “Leaning Tower of Pisa”). 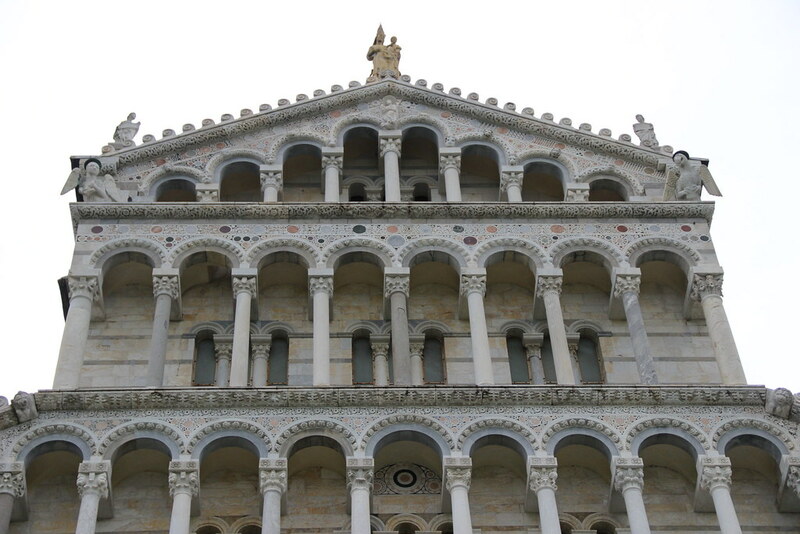 The construction of the church began in the 11th century, the baptistry and tower in the mid 12th century. We had a tour guide for a bit and some free time to take pictures and walk around (not too much time though, which was fine. After a little while I began thinking that while the buildings were gorgeous, they’re just buildings). Side note: All of these building were constructed with Arabic influences. The dark grey lines and designs were originally black, but have faded over the years. 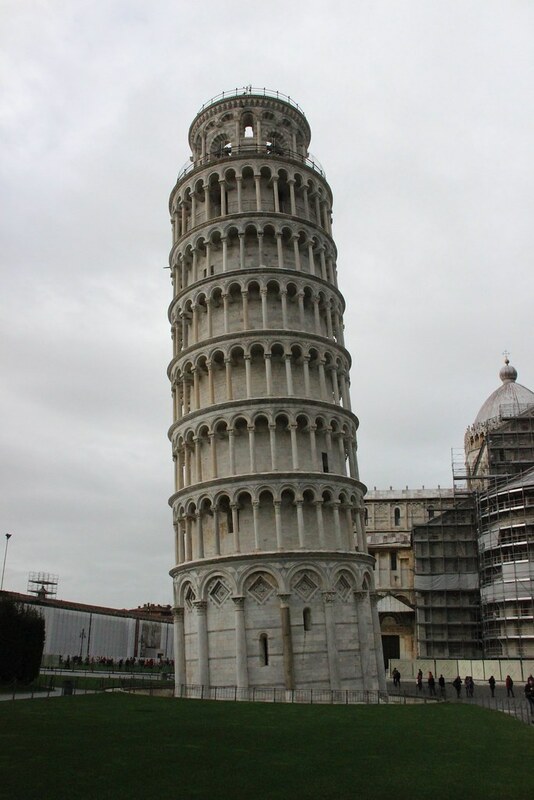 The “banana-shape” of the tower is visible here; it was the builder’s attempt at counterbalancing the leaning effect that began taking place after the first two levels were constructed. 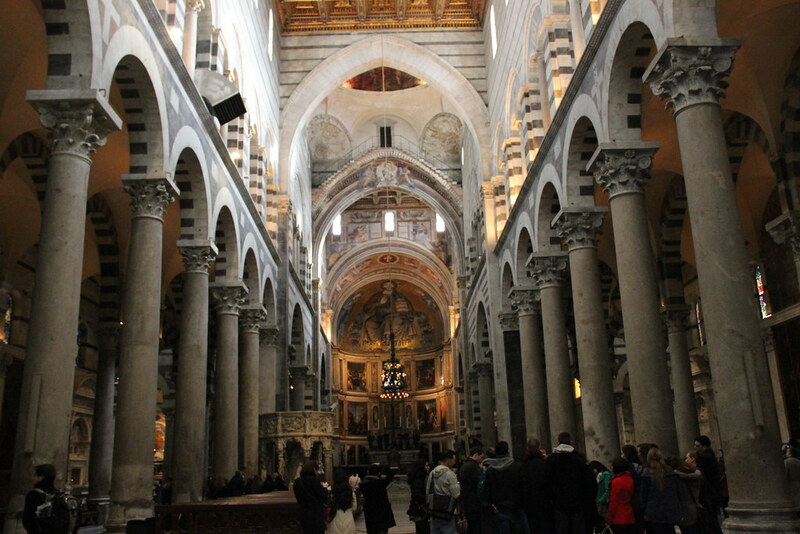 Side note: The church was the first building to begin leaning do to the poor foundations. 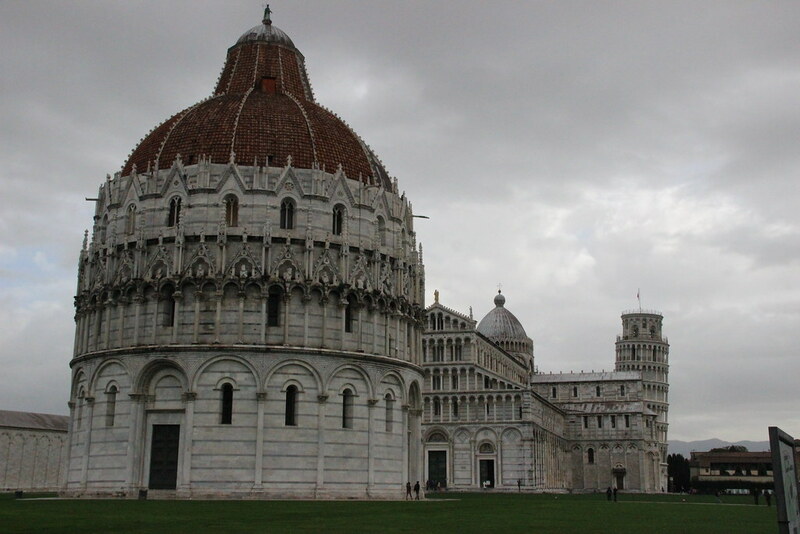 Then the baptistry began to lean, and finally the tower. 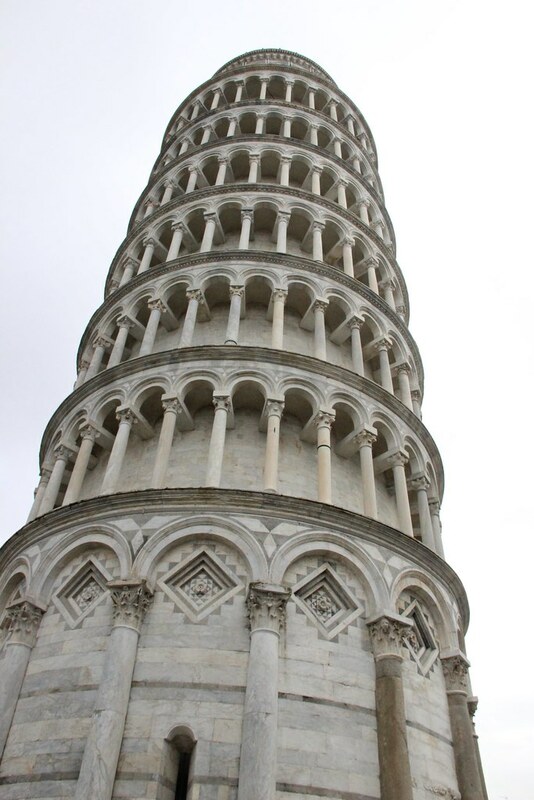 The leaning tower was originally built to be a bell tower. It contains 7 bells, tuned to the musical scale. Each bell weighs one ton, and if they were to be rung all together, the reverberations would cause the tower to collapse. 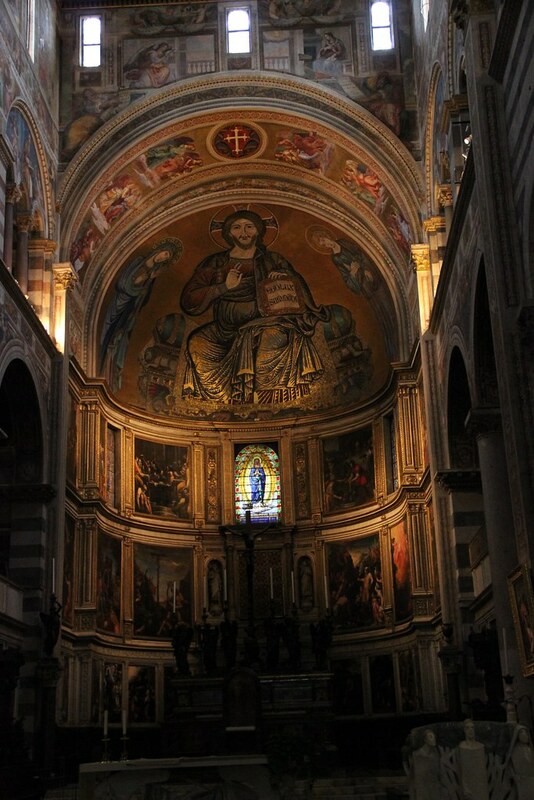 Inside the Cattedrale di Santa Maria Assunta (Cathedral of Santa Maria Assunta). Something on a wall farther away. Every half hour or so, an attendant in the Baptistry closes the doors and sings a few notes. 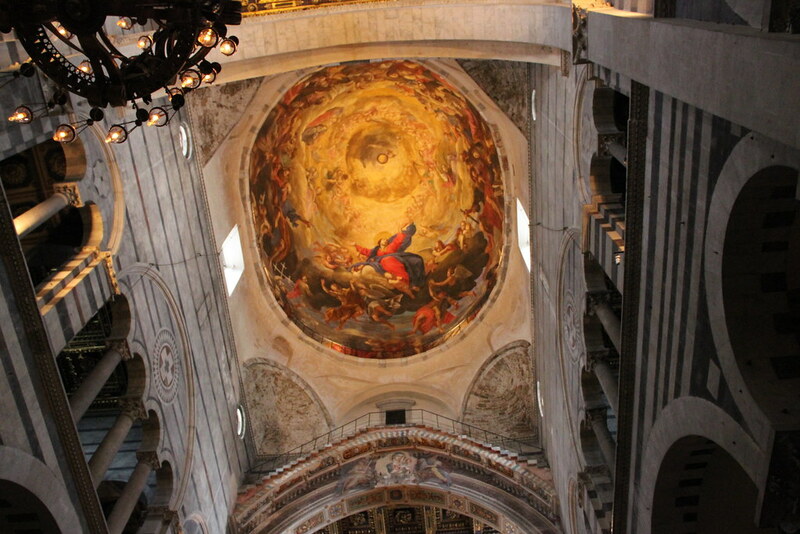 The baptistry was built to have amazing acoustics, and has a doubled dome for this reason. 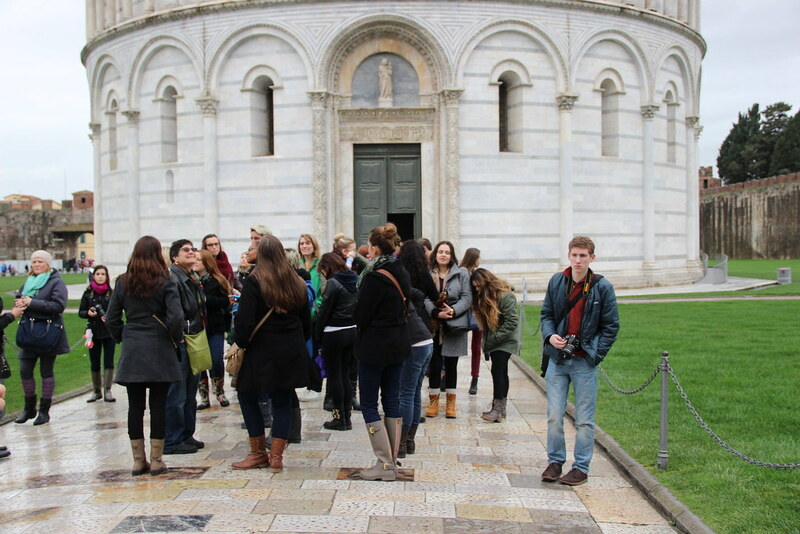 It was pretty cool, and I liked learning things about the architecture from our Pisan tour guide Antonella. 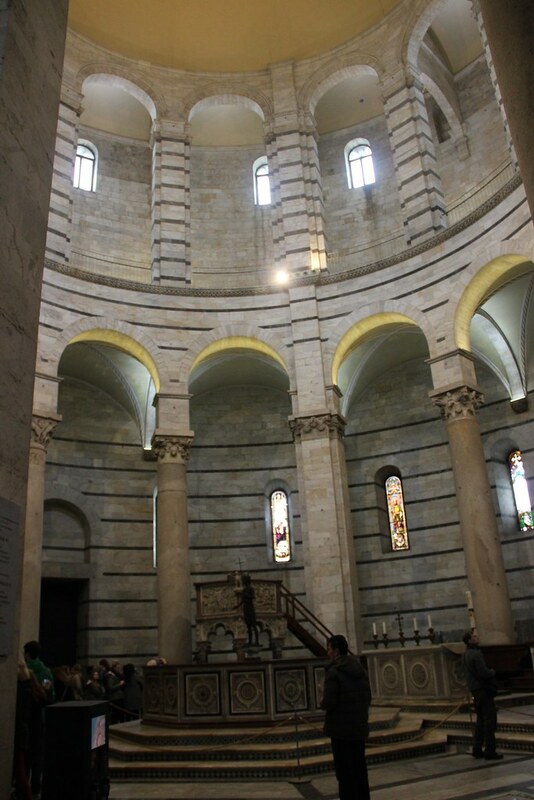 Baptistry interior. Babies were once baptized in that raised pool in the middle while held by the ankle, upside down; they were dunked 3 times in the water (which runs from underground sources, and was therefore considered pure, among other reasons). The baptistry is still active; basically babies are still baptized here, but are now simply sprinkled with the water instead of being submerged. 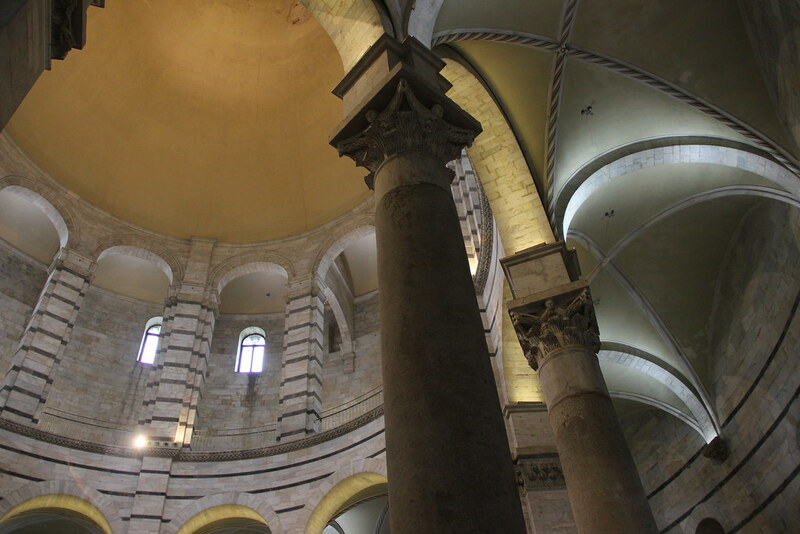 This baptistry is one of the few structures in Italy without a ceiling fresco. A man who is neither screaming nor shouting; he is singing. 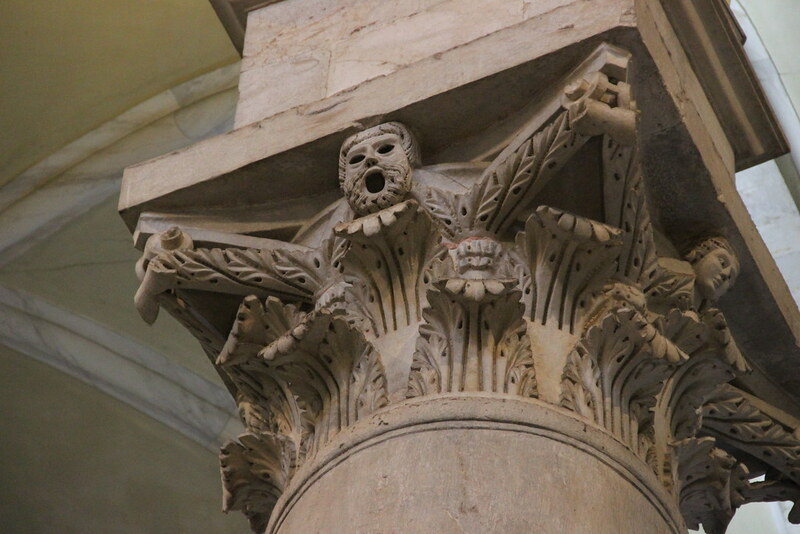 This column represents the appreciation of the choral element in the baptistry. 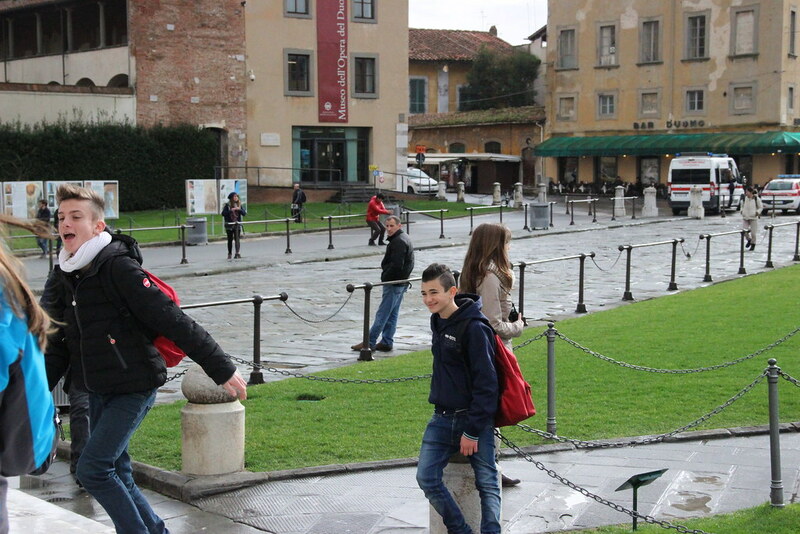 Tips for Pisa: Bring your own water — if you get thirsty, water is expensive in Pisa. 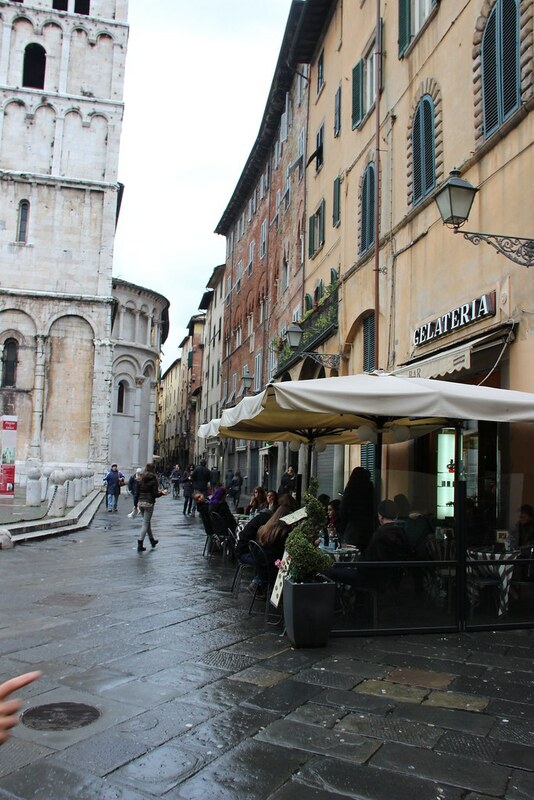 Don’t buy lunch in Pisa, it’s just not as good as the food in Lucca. 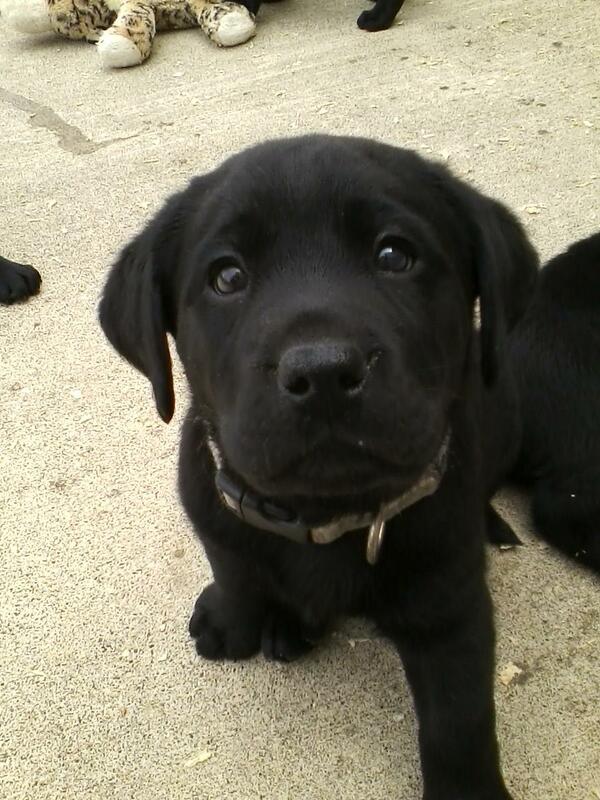 Bring a camera that’s charged with space for however many pictures you think you’ll take. Dress in layers. 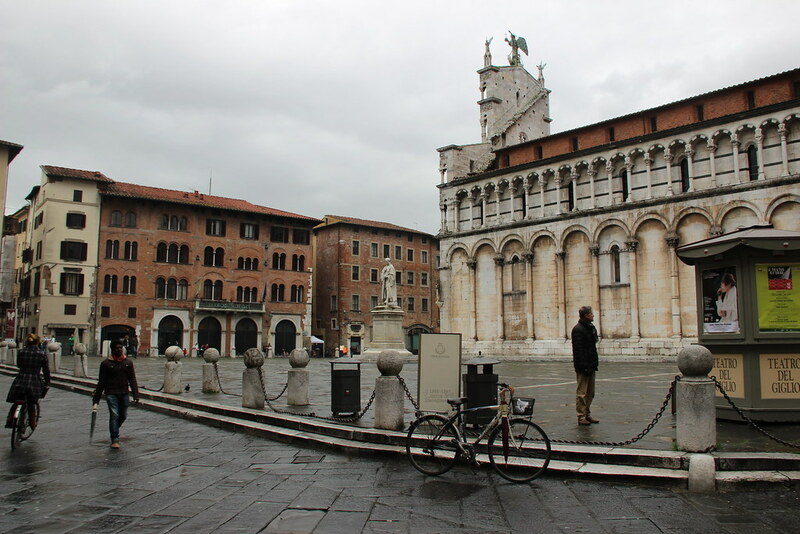 Lucca is a sleepy city 20 minutes away from Pisa, and it is a great place to visit. The whole small town is circled by a tall wall. 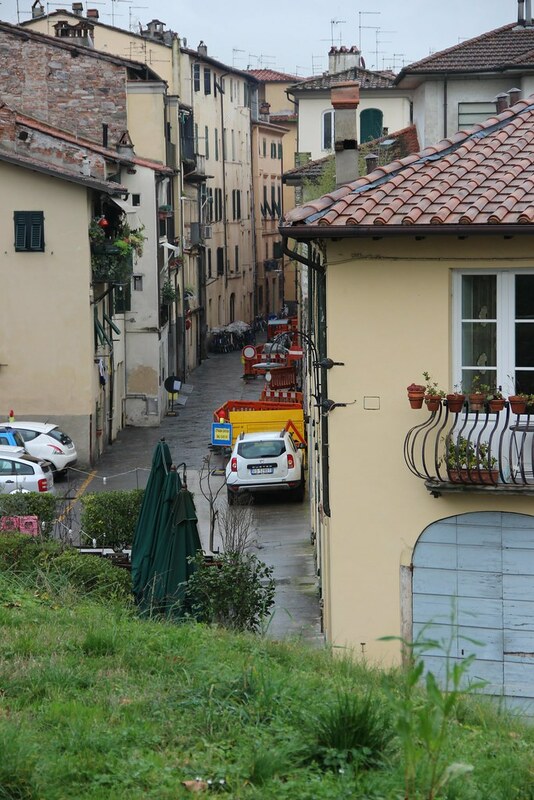 The town’s architecture is very similar to Florence, but the wall is gorgeously green, with a walkway and a spectacular view and amazingly fresh air. 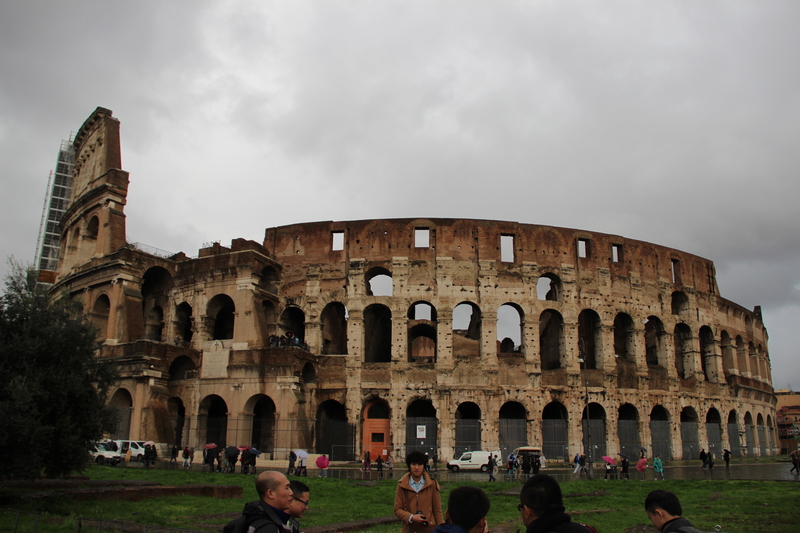 The temperature was great; it was cloudy and perfectly crisp and fresh — my favorite type of weather. 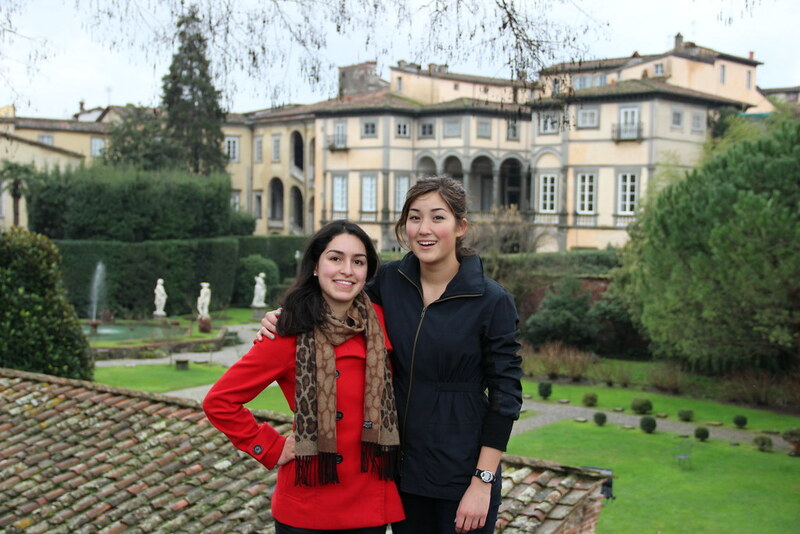 Outside the walls of Lucca. 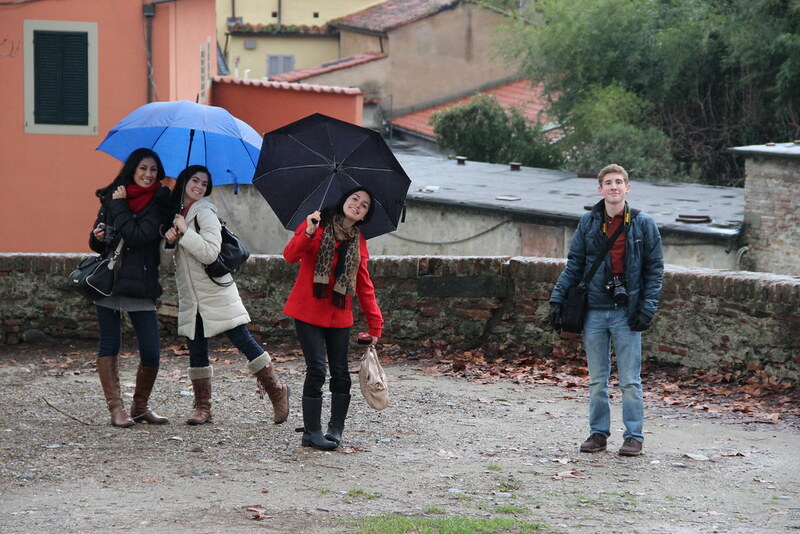 We had 2 hours of free time in Lucca. Elizabeth, Talita, Aiden, Katarina and I stopped by a coffee shop, and they sandwiches and coffee. I ate my rice lunch. 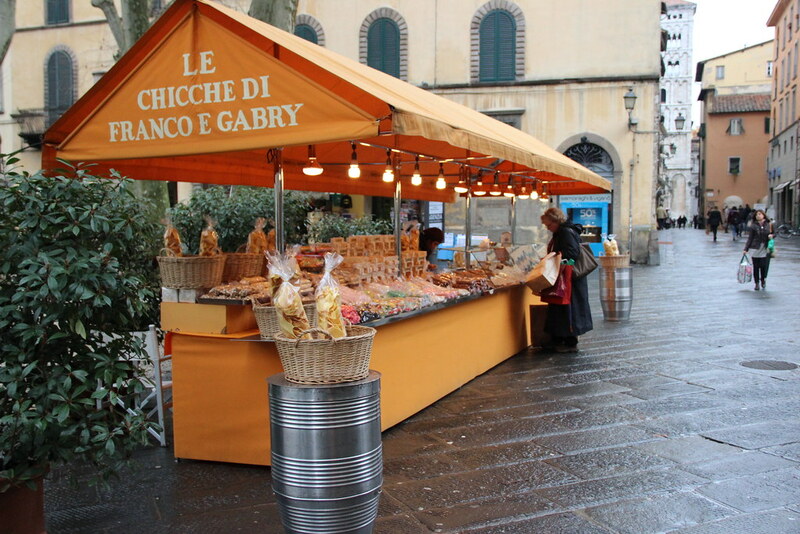 Then we bought some sweets from an outdoor stand — I got a sweet hazelnut square for 2,50 Euros. Creeper shot #4: A Hairstyle communicating. 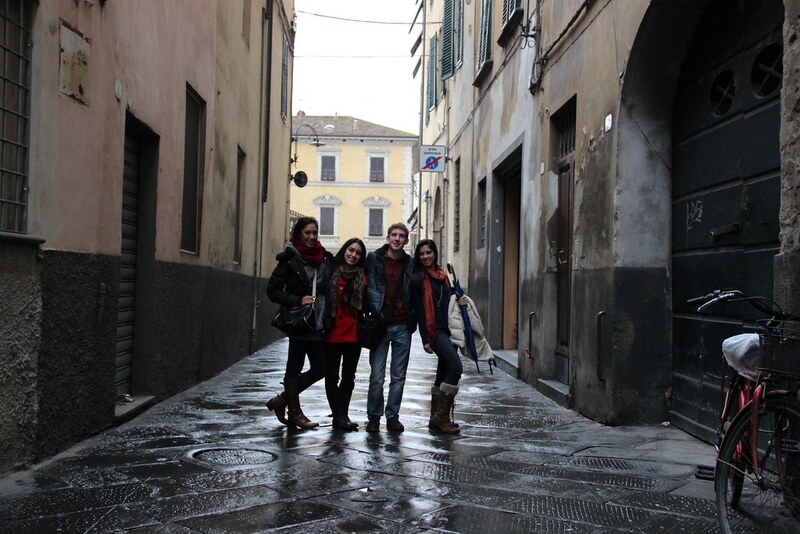 Talita, Elizabeth, Aiden and Katerina S.
Where we bought some sweets. 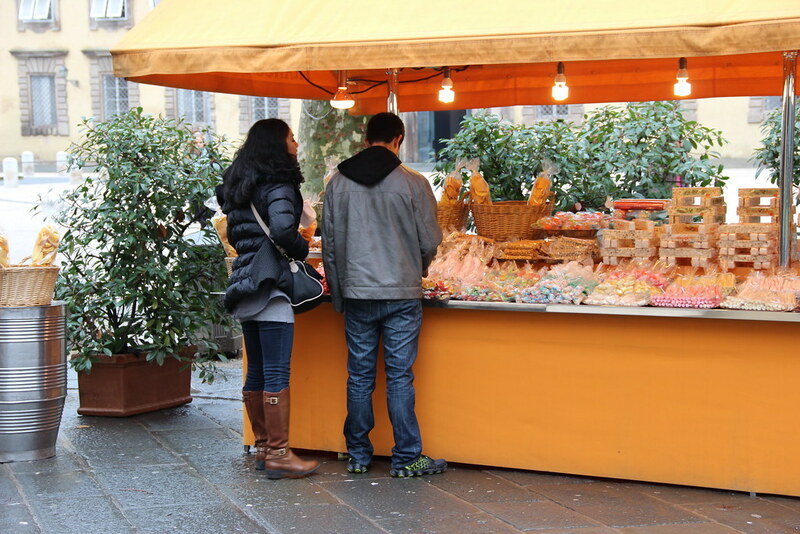 Talita and Daniel at the sweets stand. 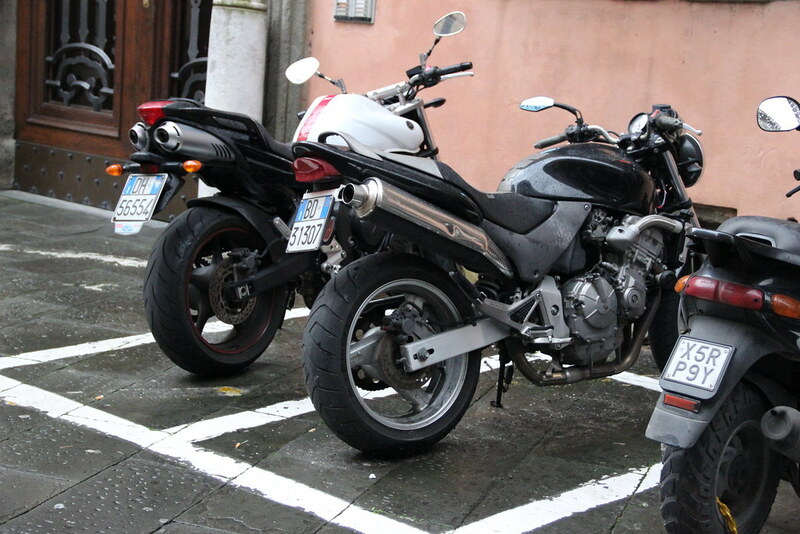 A pair of street bikes among the many scooters in Lucca. 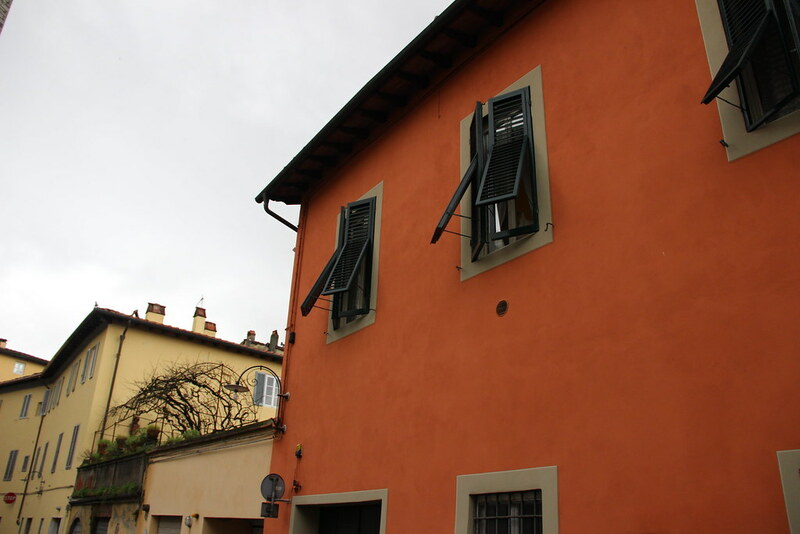 Their window shutters are really cool! Talita, Katerina, Elizabeth and Aiden. 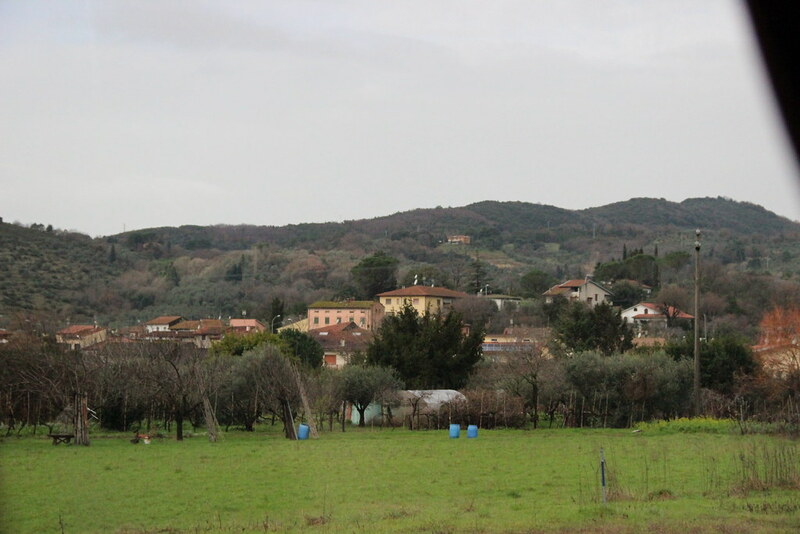 The view off of the Lucca wall. 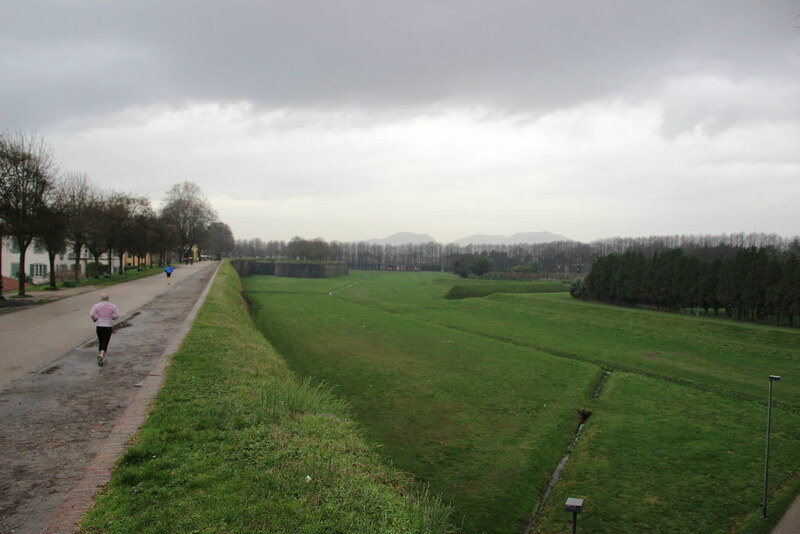 There is a bike path and pedestrian trail on top of the wall (the left side of the picture) which borders the entire city of Lucca. 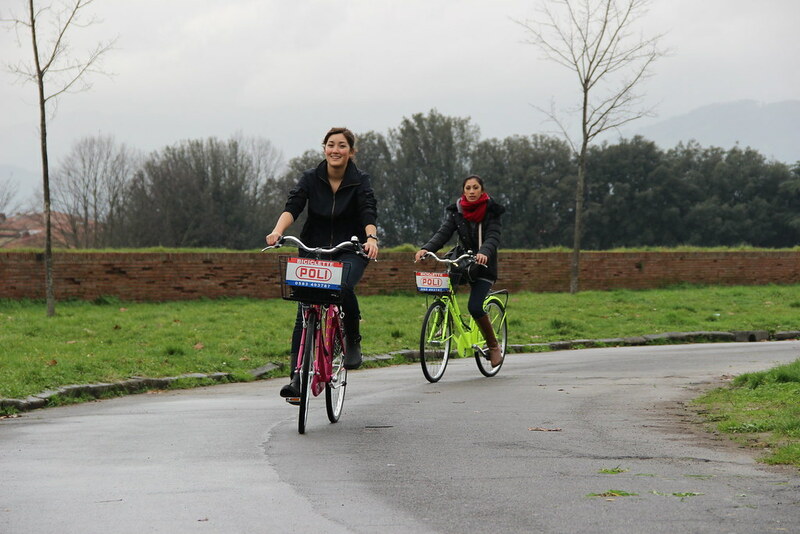 Then the five of us went biking! 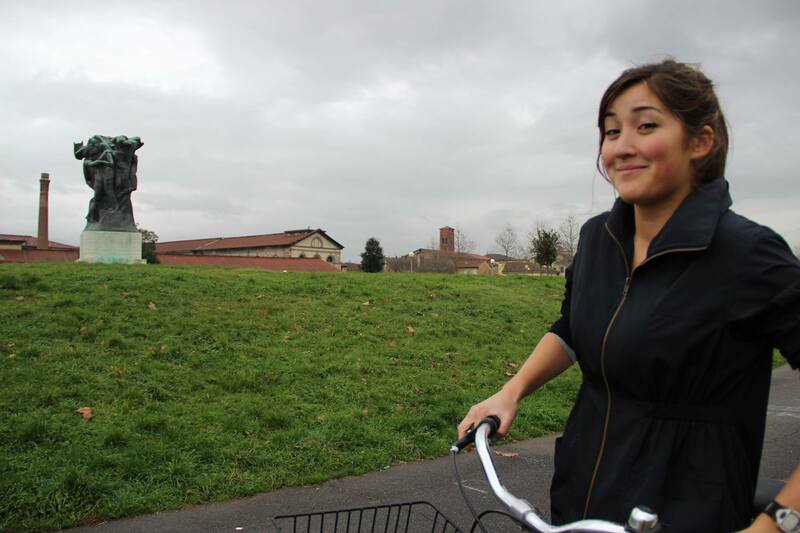 We found the bicycle rental shop, and rented bikes for an hours and biked around the whole wall (about 30 minutes) and took a lot of pictures. (It was inexpensive: 3 Euros/hour). 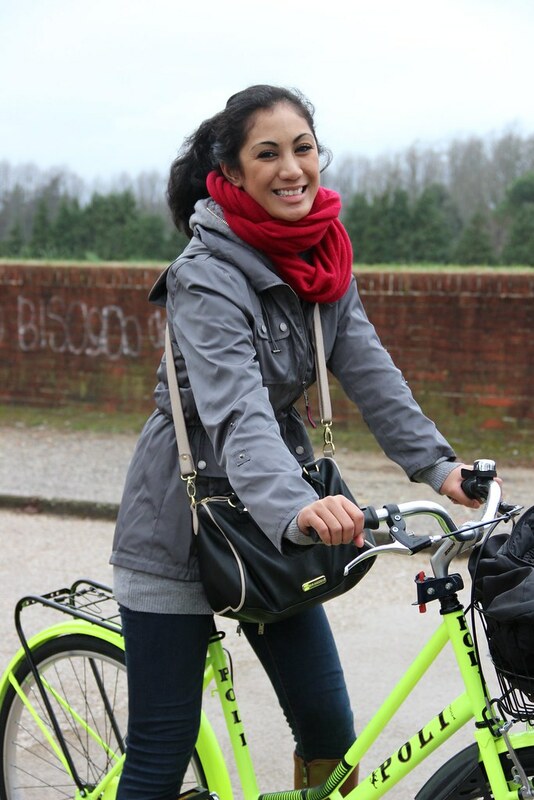 I bike at least every over day at home, so I particularly enjoyed it. 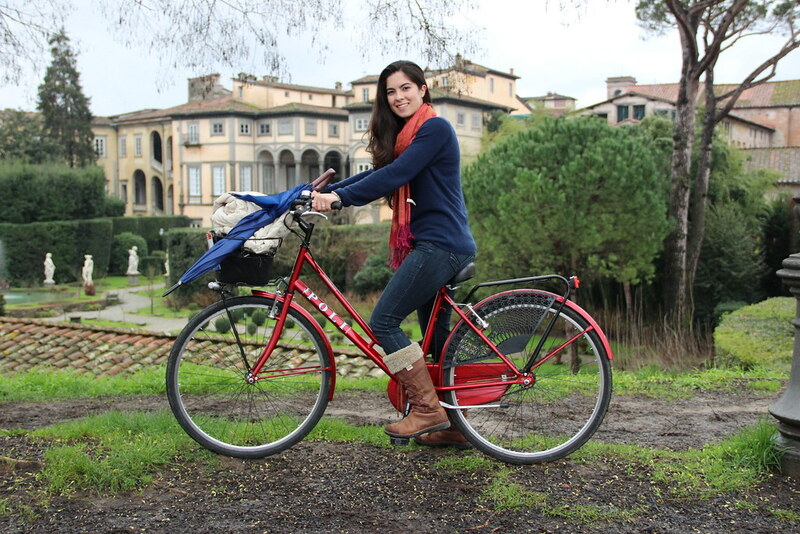 So far, biking in Lucca has absolutely been my favorite experience in Italy. There’s nothing like the view of the greenery far below the wall to one side, and the charming, colorful rooftops on the other. 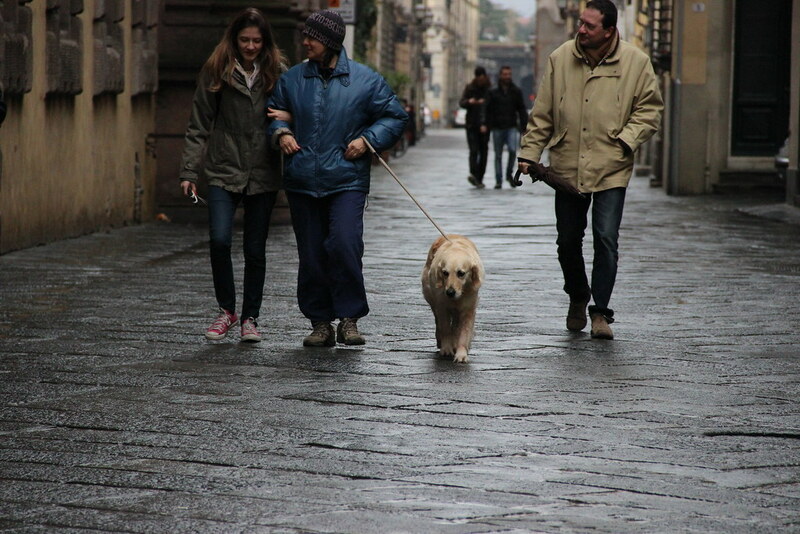 Pedestrians pass by, a few with adorable dogs, and some with strollers and children. 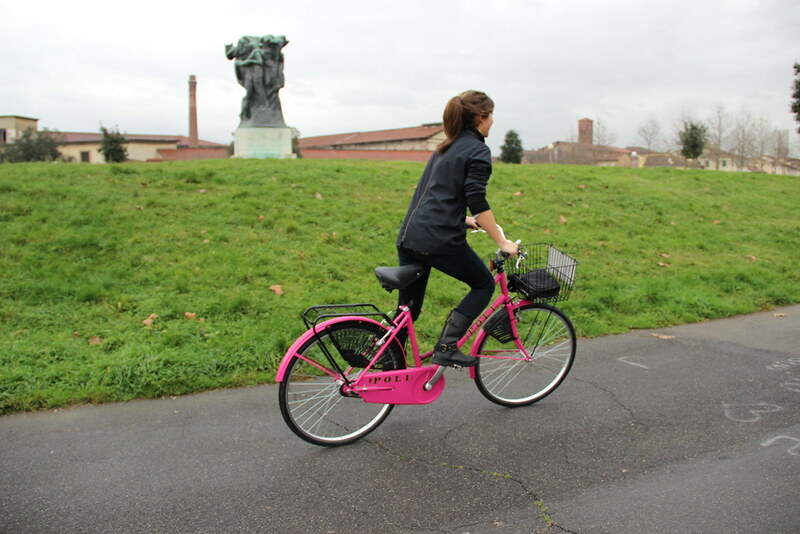 Even if you’re not confident on a bicycle, the wall is very accessible to a beginning level biker, so go do it! 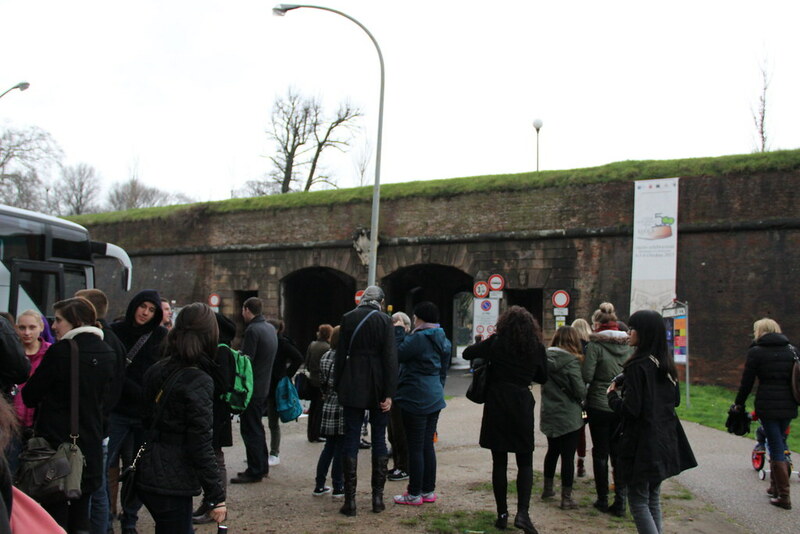 In my opinion, all the other people in our tour group that didn’t go bike missed out! 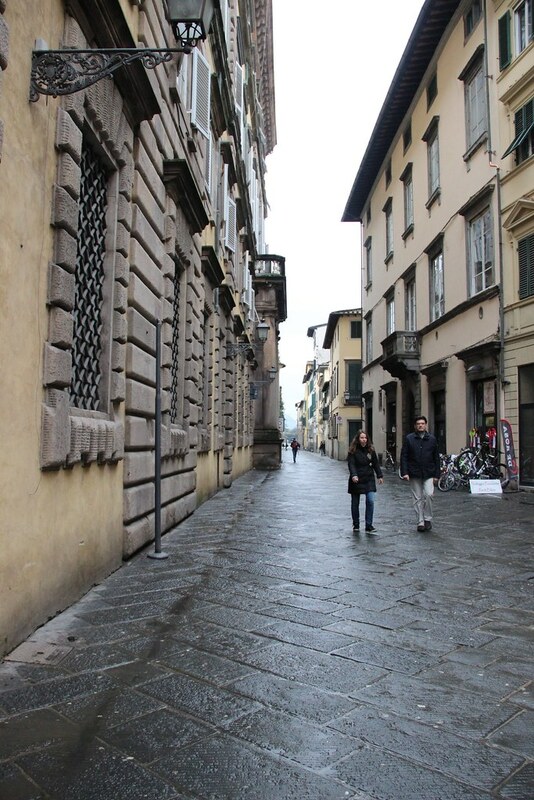 Lucca is definitely a place I’m considered visiting again, possibly with my roommate and a few other people — it’s very sweet and enjoyable. Looks like a fun day! 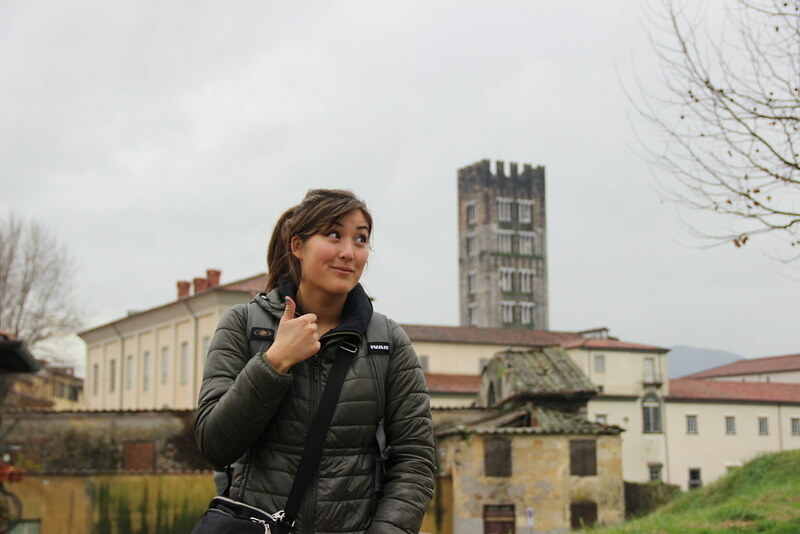 What did you think about seeing the Leaning Tower in person? Does it live up to its reputation? I didn’t anticipate the history behind the tower, like all the unique issues with its construction, and I found those parts most interesting. I think simply seeing it in real life didn’t affect me as much as its reputation suggested, but I was intrigued by tower’s history and viewed the tower with more appreciation once I knew more about it. The tower isn’t quite the tower without the story behind it (after which I found the slant pretty funny).